The Interfraternity Council (IFC) is the governing board for the fraternities comprised of seven executive officers working in conjunction with the president of each member fraternity. Our goal is to lead the Greek community at UCSB to new heights, to support members who strive for academic success, to promote brotherhood, and develop leaders for humanitarian rights in our community. At UCSB, fraternity men pride themselves on being scholars first, with every chapter holding academics as a pillar of their philosophy. Chapters reserve study rooms, organize library hours, and coordinate study groups to give their members the biggest opportunity for success. Being around academically motivated, intelligent, and hard working men fosters a culture where academics are a priority. This is highlighted by the fraternity and sorority GPA, which is consistently higher than the UCSB average GPA. Fraternities at UCSB pride themselves on athletic involvement. Countless NCAA athletes have been and continue to be a part of the Greek community, with many sports being represented throughout and within the chapters. Fraternity men also make up an integral part of many club sports teams. In addition, fraternities offer the chance to compete in every intramural sport. Without question, fraternity life creates and fosters an exciting environment to compete, and no one will cheer you on more than your brothers. The core of every single fraternity at UCSB is the bond of brotherhood. With members from all over the state, country, and world as well as from just about every major on campus, finding lifelong brotherhood and friendship in all members is what truly makes a fraternity experience so powerful. With countless events every quarter, the social interactions and memories made are unparalleled by any other organization on campus. 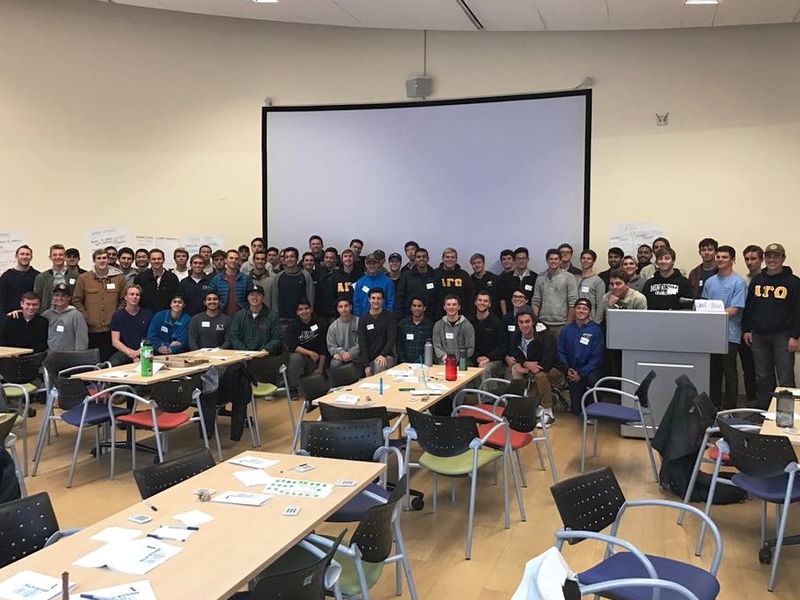 Some examples of brotherhood events include deep-sea fishing, golfing, paintball, hiking, camping trips, ski trips, movie nights, volleyball tournaments, and many more. Words cannot nearly describe the value of the powerful brotherhood and support UCSB's fraternities create. Fraternities at UCSB engage in a variety of social events each quarter guaranteed to enrich any student's collegiate experience. Fraternities will typically host a mixer with each Panhellenic sorority in a given quarter, and many fraternities will also host events with various women's sports teams at the University. Grab-a-dates are another favorite of the chatpers, in which each member is given a short amount of time to find a date for an event ranging from a dinner at the house, bowling, laser tag, harbor cruises, etc. Another highlight of the quarter are formals, where a fraternity hosts a fun packed weekend at a destination such as Vegas, Palm Springs, or Big Bear. With plenty of other events such as barbecues, philanthropic sports tournaments, beach days, and more, there is always something for everyone to do.